From the Librarian’s Desk was first published - -date, paper...................................... We will republish a new column monthly and archive quarterly. In late November, I received an e-mail and subsequent phone call that eventually developed into a rare-find. Yoland Cunningham of Belvidere, IL asked if the library would want an old graduation announcement. To my surprise it wasn’t “old” but “real old.” It was the class of 1898. In what year was the first graduation class of Gillespie High School? The library is the community’s source of information and all libraries take this job and develop it in various directions. All libraries including the Gillespie Public Library use books, encyclopedias, magazines, the Internet as a basic source of information. However, some libraries have an “in depth” collection of genealogical and historical materials. These libraries are blessed with a larger budget and space to house these materials. Unfortunately, the Gillespie Public Library has a limited amount of these materials. Information on Dr. Marvel Thomas: He was a prominent physician and surgeon born in 1855 near Plainview. He graduated from Missouri Medical College in 1884 and opened a practice in Gillespie in 1889. He was a doctor in town somewhere between 1910 and 1940. Information on Gillespie Manufacturing Co.: A lady from Arizona bought a well-constructed piece of furniture probably dated 1920-30’s from Gillespie, IL. It probably was a very small company or a “private individual” making furniture. Information on the burial site of ex-mayor (1913-15) LaBerta “Bert” Rice. Any information on any of these request by community members is appreciated. Any documents, yearbooks, programs, dairies, anything that would historically “shed light” on events that occurred in the community would be appreciated. You are the last source of this dying information and we need to somehow preserve it. So “box it up and give it to the library.” There is one immediate need and that is information and photos of the old library on top of the old fire station and Miss Willard, the librarian. Libraries have thousands of books and how do they keep them in order? Before I answer this question, we need to answer a basic elementary library question. That question is, “In what 2 categories are all library books divided”? Of course, most kids will tell you that they are fiction and nonfiction. In grade school we also learn that all nonfiction books have numbers called Dewey Decimal numbers. So where does the name “Dewey” come from? Was it named after John Dewey, father of education or Thomas Dewey, the politician? It was neither one! Back in the colonial period and early 1800’s libraries were rare and were usually maintained by colleges and universities. Wealthy individuals also collected books and created their own individual libraries. In 1636 Boston created the 1st public library and in 1803 Salisbury, Conn started the first free public library. New York City Public Library was started in 1849, as a research library and today has over 7 million books and is the nation’s largest public library system (the boroughs of Brooklyn and Queens have separate library systems). All early libraries had their own special classification systems. Some were good, others were bad! To help celebrate the centennial of the U.S., President Garfield encouraged librarians to come up with an organized library system. Melvil Dewey, librarian at Amherst College, had a system of numbers and decimals. It was chosen in 1876 as the nation’s classification system. Yes, it was Melvil! Melvil’s system has survived over 125 yrs. It is a system of 10 major categories divided up into 10 lesser categories and sub-divided into 10 more categories, giving 1000 major categories. Adding numbers after the decimal gives the system tens of thousands of groups and virtually makes it able to last forever. There have been 22 major changes to the system used by 95% of all public and k-12 school libraries. The Dewey Decimal System has categories covering every conceivable subject, but as a librarian my biggest problem is where to put a book that could be classified in a variety of categories. My philosophy is simple, I try and group them in more major categories and avoid the smaller, lesser, obscure groupings. All crime books are in 364 no matter who committed it or where it was committed. There is only one “person” who has the honor of having his personal “numbered category”. Try and guess who it might be! However, the D.D.S. is not the only library classification. In 1897 Charles Cutter helped create the Library of Congress Classification System. This system is used by 75% of all colleges and universities. This system uses a combination of letters and numbers where all authors have their own number. (Your librarian has no clue on how to explain it!) The Library of Congress is the world’s largest library. It has 30 million books of its 130 million-item collection and the collection covers 530 miles. Being this big, you “deserve” your own classification system. But anyway, now you know you a little bit about Melvil and his famous numbers and William Shakespeare is ever so grateful that Dewey assigned him 822.3. I’m not sure if this was a true athletic name or just a term used to describe general high school activities. I am not even sure when the term became our official mascot. I’ve checked several yearbooks in the 1920’s and the term zephyr was never mentioned. I’ve also got a 1943 yearbook and the term is still never mentioned, but we are still searching. In making reference to the athletic teams the term cannot be found. The term gridders, hoopsters or tracksters were used but not zephyrs. But, we do know that it was the official mascot! So what prompted the change! Here is the story! On the evening of Sep 15, 1944-- first football game of the season. The GHS gridders traveled to St Louis University High to play the Jr. Billikens at Walsh Stadium. The school was located off S. Kingshighway in St Louis near the old Highlands Amusement Park and across from Forest Park. The legendary “France” Laux announced on his radio show about the nightly football game. Whether Laux actually broadcasted the game is unsure. Laux was a legend in St Louis broadcasting. Not only did Laux do high school games but he was also the voice on KMOX radio for the St. Louis Cardinals and Browns for approx. 15 yrs. Probably not knowing the Gillespie High School nickname or assuming it was our nickname Laux said that the Jr. Bills were playing the miners from Gillespie. He was making reference obviously to the local mines and their tough occupations. His reference changed the perception of the school and Laux remains a part of the folklore of the Miner nickname. He obviously made an impression on Gillespie listeners to potentially change the mascot name. The GHS gridders/zephyrs played the Jr. Bills to a 7-7 tie before 1,800 football fans. Jack Ridinger scored Gillespie’s lone TD and Tom Tallman scored the extra pt. The Jr. Bills Ed Obbereither returned the ensuing kickoff 95 yds to tie the game. A Post Dispatch sports article indicated that the Jr. Bills were lucky to escape with a tie because Gillespie dominated the entire game. Gillespie had 18 first downs to SLUH’s 4 first downs. The game was nothing spectacular but noteworthy enough for what will happen back in Gillespie. Sometime that month there must have been some discussion of the name change. Several options for the new athletic nickname were the Miners, Gophers, Hornets, Wolves, Trojans, Dragons, Hawks and Longhorns. But the HS student body voted on the Miners. The High School and probably the School Board voted on the change in Oct. 1944. In the “High School Notes” article of Oct 26, 1944 of the Gillespie News it was first stated that the Zephyr mascot has been changed and that Gillespie Athletic Teams would now be called the Miners. A “Special Thanks” goes to Joe Dona. When the request came to the library for some help I knew Joe was the man to call! Joe also assures me he is going to have a lot more assorted information in the near future! There is a place located at 201 West Chestnut, one block west of Dippolds and “catacorner” from the Masonic Lodge and that place is “your local library.” Everyone knows where the library is located--Right! Our loyal patrons, probably around 100 avid readers, know the location well and perhaps even have a standard parking spot. Then, there are the hundred others who stop in occasionally, maybe once or twice a month or several times a year, especially when they need something to read. Then there is the next level of Gillespieans who know where the library is and that’s about it. 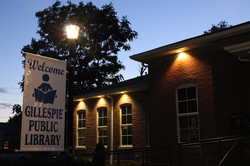 The library is considered by public standards as a place that “ties the community together.” Augustine Birrell, British novelist and politician, says, “Libraries are not made; they grow.” This quote accurately describes the history of the Gillespie Public Library. The library has definitely grown from upstairs in the old firehouse and Miss Willard to the original Little Brick School , along with the new extension in 2006. The intent of this column is to inform. Libraries are a source of information. I will talk about libraries and things that the library can do for you. I’ll tell you about our library and collection. I’ll talk about the past and “remember when”. Hopefully my history will be correct (if it’s not--just correct me). I’ll talk about changes in the libraries and there has been many since the computer age. We have several groups that want you to get excited about “your library”. One group is the dedicated Library Board members who serve because they know the importance of a library and the other is “Friends of the Library”, a volunteer group, who help raise funds for children’s books and sponsor community programs. Hopefully the column will spark some interest. Oh by the way! Here is a bit of library information. Birrell’s library quote came from a major reference quote book, Bartlett’s Familiar Quotations. Another interesting tidbit!! We are located “catacorner”, “catercorner” or “caddy-corner” from the Masonic Lodge. I wasn’t sure if it was “catty- corner” or “kitty-corner” or what the correct spelling was or even where the saying came from! All I know is that my Mom and Dad used it to use it to mean “something on an angle”. This is what I found out! The definition evolved from the Middle English or Middle French word, “cater”, meaning 4 spot. Today, “cater” also means to cut across diagonally. Anyway, we are diagonal from the Masonic Lodge! So even the librarian has to look it up!